Many from the HTO group are working in the area of AI, automation and digitalisation. Bengt Sandblad is writing a book in the area related to security. 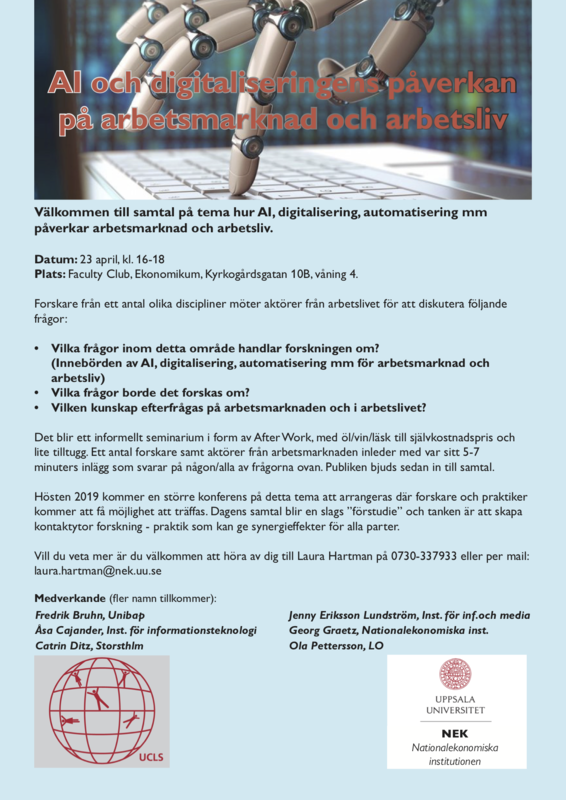 Gerolf Nauwerck does a study on automation of an application process in Social Services and Åsa Cajander is interested in the area from a work environment perspective. Also, we follow some of the ongoing digitalisation efforts with automation in health care through the DISA project. We are all going to this interesting event where the effects on working life and work is discussed. The DISA team had a workshop with their reference group earlier in March, to prepare for the last stretch of the project: creating the eWorkEnvironment framework. To start with, the reference group, representing both people working in healthcare and other researchers, was given an update of the last developments of the project. Both Diane Golay’s presentation about nurses’ invisible work and Thomas Lind’s presentation of an interview study with the people responsible for acquiring, implementing and maintaining the systems inspired a lively discussion about further problems and in particular the gaps between the different actors: decision makers, IT professionals and nurses, and how usability falls in these gaps. The survey presented by Minna Salminen showed that younger nurses sometimes can be more negative to increased use of ICT, and that attitudes to a digital tool are not only grounded in attitudes to technology, but also, for example, in attitudes to patients and patient empowerment. The afternoon was spent in discussions where the DISA team got several inputs to their original ideas of what should go into the eWorkEnvironment framework. The definition of the target group was one of the tricky questions discussed: “Decision makers” in the process of acquiring and implementing digital tools for healthcare are the target group, but they can be found at many different levels and in many different roles in the healthcare hierarchy and, in addition, the organization varies between different regions in Sweden. Once these “decision makers” are conceptualized, strategies are needed to make them interested in and observant to the effects of digitalization on nurses’ working environment, for them to be interested in the eWorkEnvironment framework in the first place. The reference group had valuable ideas of what strategies could be used to get the message through. While the message from the DISA team has been that nurses need to be heard when implementing new digital systems, the reference group pointed out that also outside eyes are needed in the process: in addition to nurses’ experiences, outside eyes may help to verbalize aspects that may go unnoticed by nurses themselves. 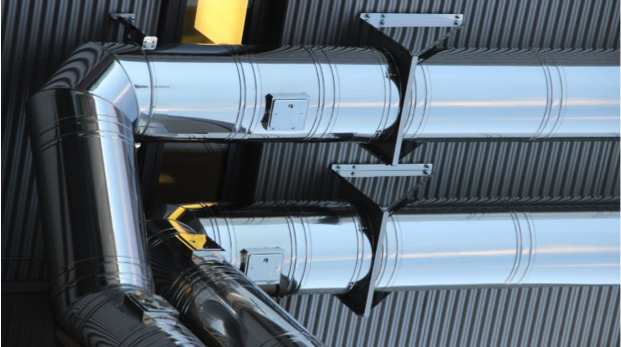 The DISA team and the reference group agreed that a major problem is the “parallel pipelines” approach to digitalization: there are several actors who all work for more digitalization, but nobody has a whole picture on how the situation looks from the daily working perspective of a nurse and the different systems are not integrated. 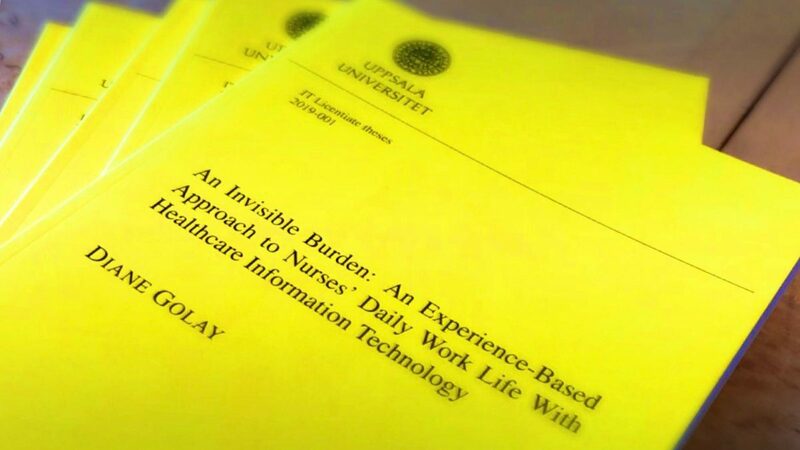 The normal way of working in projects exacerbates the situation: each introduction is a project of its own, that not only is not connected to other projects running in parallel, but is also often terminated long before the new digital tool has become a natural and useful part of nurses’ daily work. Having a diverse and competent reference group is certainly an important asset for a project! We are grateful for their time – and are further inspired to try to give something in return, both for the healthcare staff and for the scientific community. My name is Edvin Cajander and I am 15 years old and come from 8th grade in Heby skola. I have been doing a work experience programme with the HTO group for one week. I have updated the Project DOME page, including updating the pictures, some dates and information about the researchers. After that I updated the activities with some conference, presentations and meetings. I also worked on putting in some Journal papers and conference contributions and sorted them all out from the new at the top and the old ones at the bottom. When I was done with the Journal papers and the conference contributions I upgraded the Project DOME WordPress site to a subscription for 30 Skr a month, which gave me the ability to change the theme on the site and sorting everything out again. Working as a Researcher was a tough ride with a lot of thinking trying to learn so much new thinks, at the start I felt like it would take years to do everything i was supposed to do but when I got into the instructions I ended up finishing all the things in a couple off hours. My Mother, Åsa Cajander, believed I would not finish everything in the length of my whole week, so she did not really believe me in that case. Then I got the other task to change the theme of the the project DOME site and I also finished that so now I am here got a new thing to do and write a blog about what I have done the last week.It felt like a very long week because I did so many new things and that was very exiting. It felt good doing something new this week and being around new people. I actually got stuck at my “missions” from mom and it actually was very fun working as a researcher. 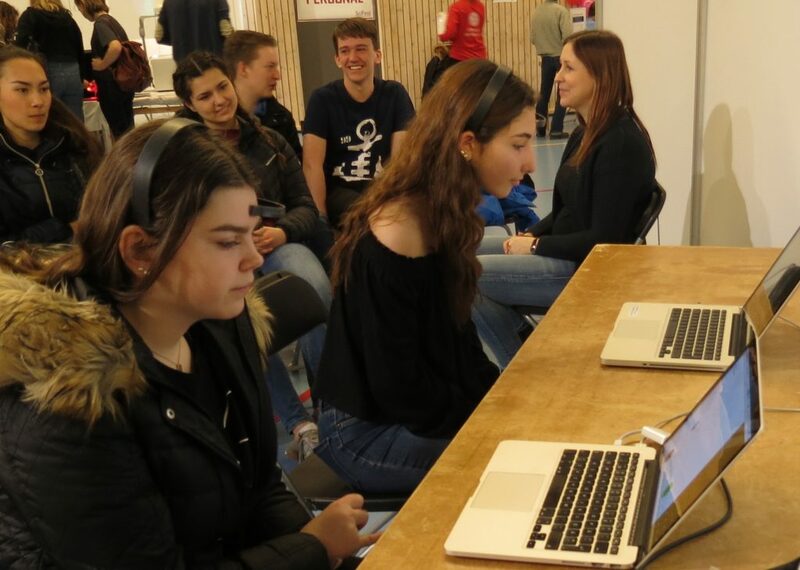 This is the second time visiting the Uppsala SciFest 2019, and it was an intense first day. School class after school class visited the booth in which I demonstrated the use of EEG-equipment as a simple Brain-Computer interface. The challenge is to focus your attention on one of two small circles on the screen in such a way that it starts to move. This is difficult since we are not used to using our brains in this way. Full concentration, focusing on moving things on the screen, just by thinking hard. However, after training for a couple of minutes, many of the visitors actually managed to make the desired circle move more than the circle not focused on. The problem is that it is not possible to describe how you do this since the learning is made in the brain, rather than as a conscious activity. This was a continuous source of slightly embarrassed comments: “I don’t know how I do it, but it just happens…!“. And that is a very good observation. This skill is actually very much like keeping the balance on a bicycle, you know when you get it right, but no one can tell you how to do it. All in all, the first day at SciFest was a success, so I will just keep my fingers crossed that the rest of the SciFest will continue just as well, including on Saturday, when it is open to the public. This years’ IT in Society Class got the task from Region Uppsala to look into primary care. Students in this class come from Uppsala University and the highly prestigious Rose-Hulman Institute of Technology. Anne Peters, Mats Daniels and Åsa Cajander are teachers in Uppsala, and Cary Laxer is the teacher in Indiana.